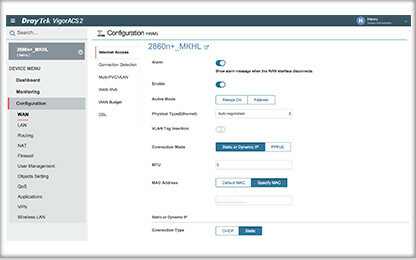 VigorACS 2 is an advanaced software that helps you to configure, monitor and maintain your DrayTek devices remotely. 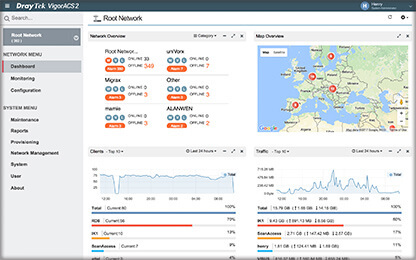 Check out this video overview to learn how it can help you to accelerate deployment and ensure maximum uptime of your all important networks. 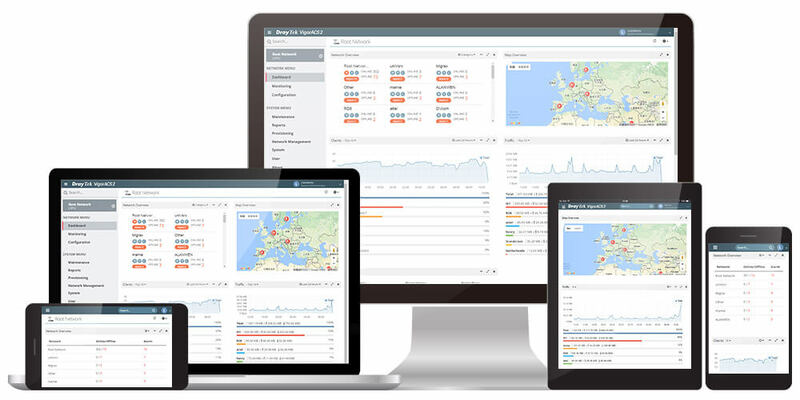 Struggling to keep your grip on all the network devices in your businesses? Sick of wasting time manually applying important firmware upgrades? Bored of logging in to each router individually to apply VPN settings? A lack of router configuration backups keeping you up a night? DrayTek’s Vigor ACS 2 solves all these problems! Once your businesses network equipment gets into double digits (e.g: modems and routers in remote branches, stores or offices around the country or even around the world), manually managing them is difficult, time consuming and prone to mistakes. Software updates don’t get applied in time, leaving your business vulnerable to hackers. VPN misconfigurations result in frustrated users and downtime. Not having a backup of each device’s configuration will mean lengthy restore times and man hours to get business operation again. By utilising VigorACS 2 in your business, all your network devices like routers, switches and wireless access points can be managed centrally, from a single desk, over the Internet. Backups of each device are taken automatically, software updates to routers and access points can be installed automatically, if something goes wrong with a device, administrators can be contacted. VigorACS 2 makes installing new devices a snap. Instead of having to send an expensive technician out to a remote site to configure it, just have someone plug the device in to the network and the auto provisioning feature does the rest. Once the device is on the network, it will receive pre-configured data such as IP, PPPoE, VoIP parameters, etc. from the ACS server. Network Menu with selected network/device. System Menu for system-wide configurations. Drop-down network tree by network/device filter. Lock device tree makes swapping between devices simpler. 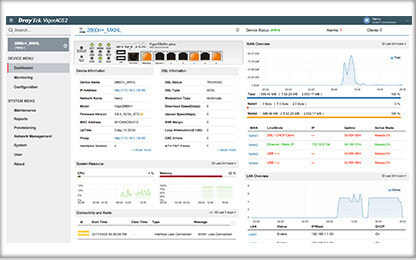 VigorACS 2 has a modern dashboard, providing network administrators with a quick and easy to read overview of their network devices. From here, precise logs allow for complete knowledge over device use. 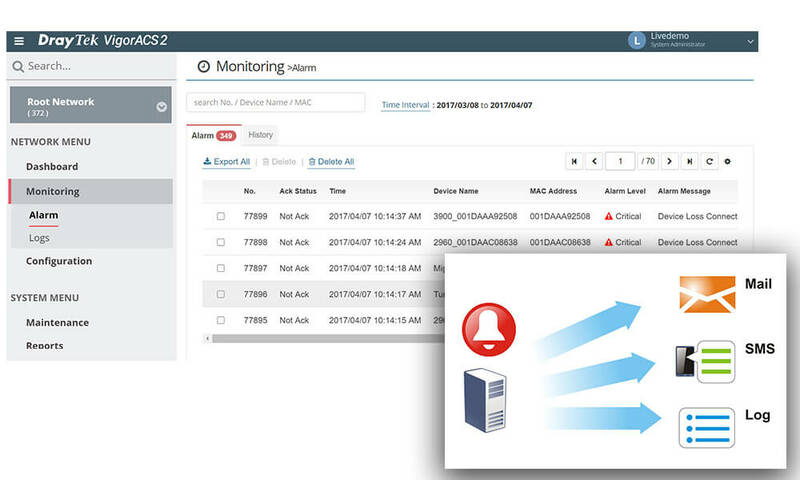 For even more network insights, VigorACS 2 can generate reports that include device summaries, status of CPEs, LAN/WAN statistics & graphical charts, firmware versions and CPE IP overviews. This level of information makes audits a breeze. For the ultimate in flexibility, the web dashboard is fully responsive, meaning it will work on smartphones, tablets, laptops and desktops. 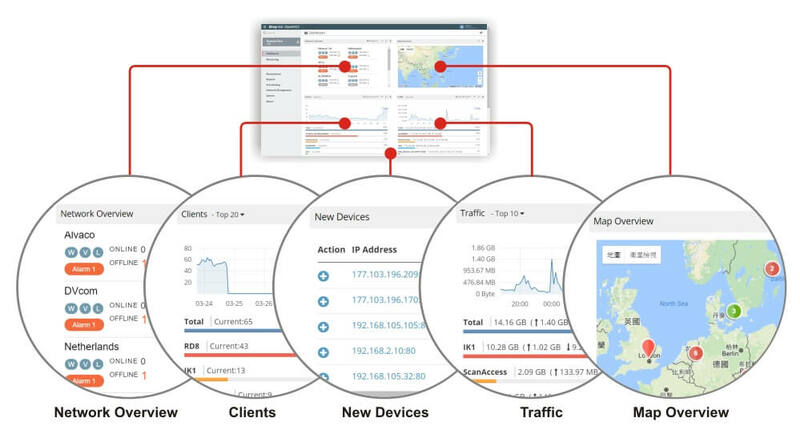 Manage your network anywhere, any time. Toggles and switches to enhance user experience. Switching between selections to filter the contents. Hint beneath the item for the explanation to that function. VPN configuration can be complicated and confusing, but with VigorACS2, you’ve got an easy method to create VPN tunnels between two devices. Simply drag the icon of one device and drop it onto another to create a VPN tunnel between the two devices within seconds. Selectable options include the type and encryption method for the VPN tunnel. No messy scripts or hundreds of options, just a simple GUI gets reliable and secure VPNs operating on your network. VigorACS 2 provides an easy method to create VPN tunnels between two CPE’s. Simply drag the icon of one CPE and drop it onto another to create a VPN tunnel between the two CPEs within seconds. Selectable options include the type and encryption method for the VPN tunnel. 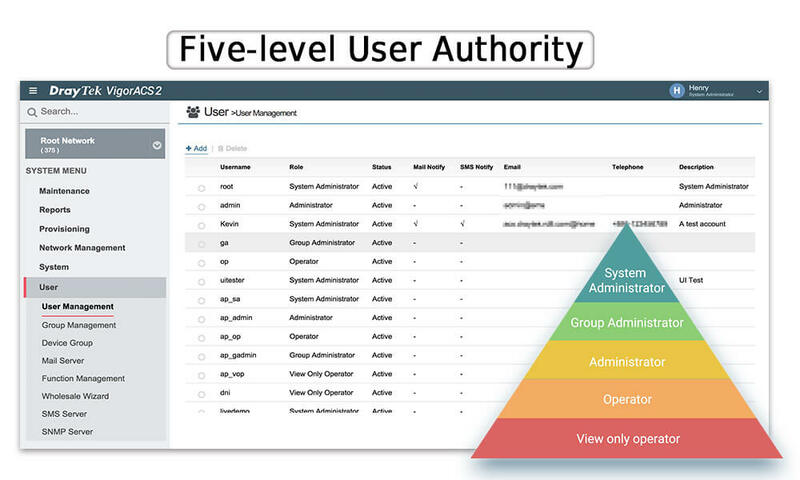 User Management provides 5 privilege levels for users to log into VigorACS 2. These are: System Administrator (the highest), Group Administrator, Administrator, Operator, and View Only Operator (the lowest). User accounts can also be assigned to a group and management authority for certain devices (by network) be assigned to a user group. Responsive Web Design (RWD) enables viewing on various screen sizes, including PC’s, tablets, smartphones etc. By using a central management system like VigorACS 2, not only do you save time and improve reliability, but you also save money. For example, if you had to upgrade the firmware of 20 devices on-site and it took 10 minutes to do each one, that’s 3 hours and 20 minutes of labour. Using VigorACS 2, that update only takes 15 seconds per device – only 5 minutes in total. If your IT administrator’s rate is $150 per hour, you’d be saving $488 each time there’s a firmware update. The cost savings are even greater if your business has 500 devices, where the money saved can be in the tens of thousands of dollars. VigorACS 2 can be purchased by businesses or organisations with self-hosted servers,for licenses of 25 nodes (ie CPEs) each up to 1,000 nodes each. IT service providers or system integrators can setup self-hosted or cloud based Automatic Configuration Servers (VigorACS 2) for their own customers. For example, with a license of 50 nodes, you can serve up to 50 customers with 1 node each, or 5 customers with 10 nodes each. For each Vigor device purchased, DrayTek provides a FREE 30-day trial version of VigorACS 2 client software as well as the Web Content Filter. Consult our sales team at sales@i-lan.com.au for a free trial of VigorACS 2. You can also contact our technical support at support@draytek.com.au or call us at +61 2 9838 8899 for any technical issues regarding DrayTek products.